Carved deep within a mountain, and lit up with multi-coloured mood lighting, La Catedral de Sal, or the Salt Cathedral, is one of those must-visit kind of destinations while you travel Colombia. I visited along with a Portuguese friend who had been living in Colombia for a couple of months but wasn’t yet won over by the country’s charm. He was happy living in Cali, but was forever comparing it to his home town in Portugal. When he told me he was coming to Bogota, I was really eager to show him the very best the city had to offer. Unfortunately, though, I failed miserably. I accidentally took him on the Transmilenio during peak hour, which is a terribly uncomfortable experience, especially for someone who isn’t used to getting so up close and personal with their fellow passenger. But luckily he was a really good sport about it, even though we spent our one-hour ride with our faces pressed up against the bus window. Now, I know what you’re thinking, the Salt Cathedral isn’t even in Bogota! I know, I know, but it’s close enough that we could get away from the chaos of the city for the afternoon and make a day trip out of it. 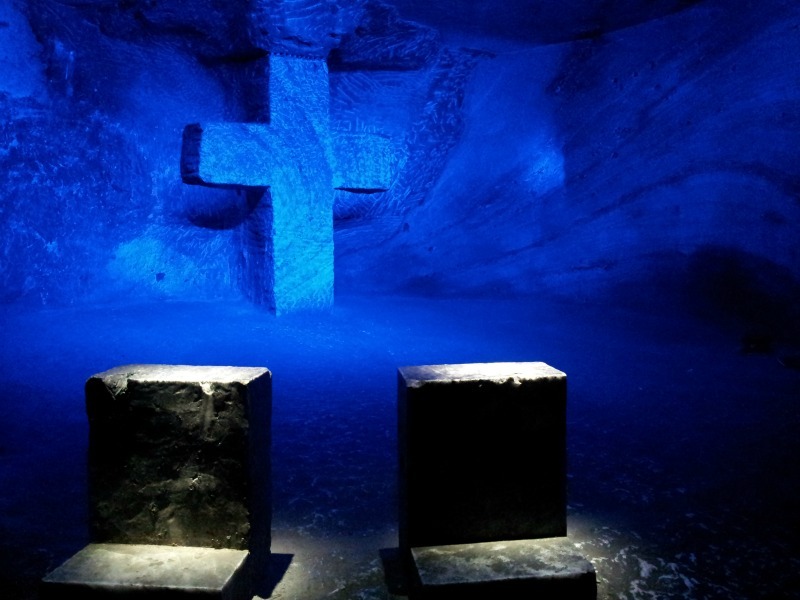 The Salt Cathedral is actually in a small and very picturesque town called Zipaquira, which a great place to visit while spending some time in the capital. 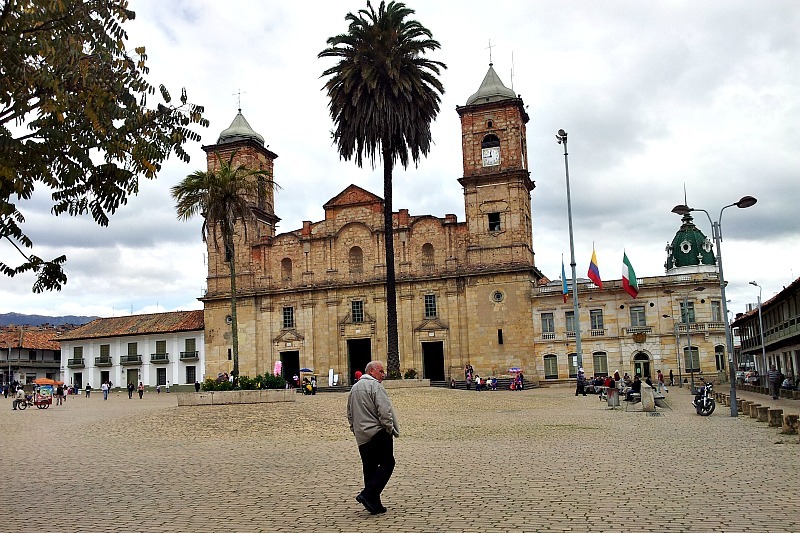 We took the bus into Zipaquira and it dropped us off in the centre of town, right in front of the church and the main square. We got off as people brushed passed us, selling their salted mango pieces or soft drinks cans from small carts. The place has a quaint village sort of vibe, but you can feel the eagerness as the trickle of tourists come in. After a short stroll from the main square, we asked the locals to point us into the direction of the Salt Cathedral. A line of people were at the top of the mountanside, waiting to enter the underground place of worship. A cathedral of sorts was carved out of the mountain in the 1930s by miners in the area. It was used as a place of prayer at the beginning of their long and precarious days working the mines, but it has since been refurbished and reconstructed to form the impressive cathedral it is today. There’s also a memorial area for the miners who sadly lost their lives toiling underground, a reminder of the people who risked their lives for the development of their country. According to the Colombian export commission and tourism board, ProExport, the salt excavated from the mine was used to fund Simon Bolivar’s campaign to bring independence to the country. No doubt the cathedral brings in crowds of patriots, religious folk and tourists alike, from around the country and the world, but for the devout, the Salt Cathedral is a place of pilgrimage. The busiest day of the week is Sunday at the Catedral de Sal, when thousands of people walk through the illuminated tunnels, but Easter is when the real crowds pour in. If you pay a visit on a Sunday, I’d suggest going early. As my Portuguese friend and I entered the underground monument through an illuminated tunnel, I was afraid the claustrophobia would set in – a fear I developed after being dragged around the house in a sleeping bag by my younger brother when we were kids – but the bright lights, high ceilings and the immense underground space was enough to stop me from hyperventilating. 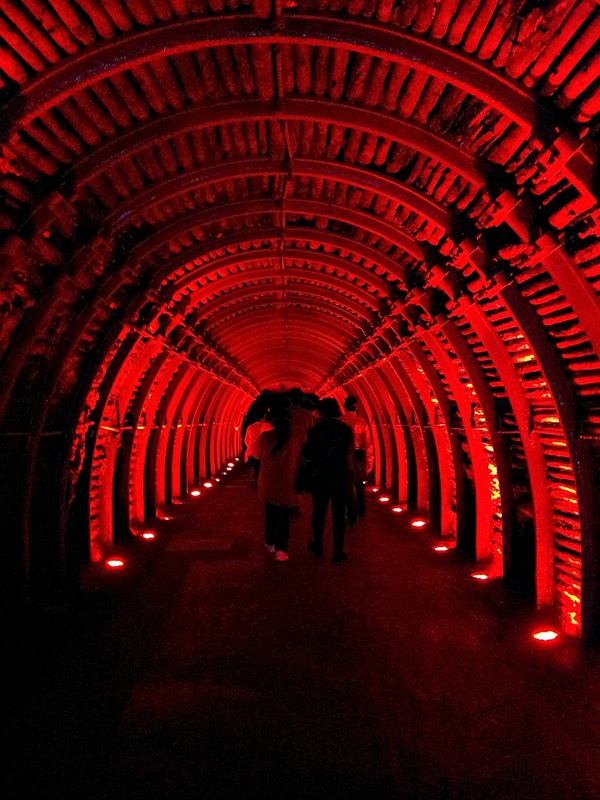 The much-welcomed lit-up pathway guided us through the underground Stations of the Cross, with colourful lights pointing us in the right direction. I don’t know if it was the large crowds of people, the memorial or the large glowing crosses that did it, but walking through that dimly-lit underground space was as moving as it was visually spectacular. And, experiencing my own personal miracle during the trip, my Portuguese friend didn’t mention his hometown once. Catch a bus from Portal Norte in Bogotá to Zipaquira or there is the train that runs on the weekends. I´m not usually claustrophobic, but I see how you´d feel that way when underground with dozens of other people! I´m making a mental note not to visit Zipaquira on a Sunday. All of these pictures look so mysterious, and I especially love the red-hued one. What was the sound like? Was it echo-y, quiet, loud…? Cassandra! Your comment went under the radar! Haha it is definitely worth a visit. The space is so huge that you forget you’re actually underground. The sound, I can’t really recall the sound to tell you the truth. I think it was muffled chatter and echo-y. It is very nice safe and nothing claustrophobic; noise as much echo, sarepa if you are still in Colombia I would like to invite you to dinner or lunch at a typical Colombian family !!!! and thanks for the description you do for my country. already knew the coffee zone? ARMENIA !!! Carlos, thank you so much for the offer. That is too kind! Oh, yes I know the coffee zone and Armenia, but I wasn’t there for very long, so I will have to make another visit to really get to know the place. When I started walking into the Salt Cathedral with a crowd, I was very skeptical, and honestly, not very happy. Until we got further down into it, at which point, I was completely amazed. It turned out to be one of the most beautiful and incredible things I have ever seen! Absolutely something worth doing while in Colombia. Thanks for the blog I am trying to put my travel pictures into photobooks and I spent a fabulous week or so in Colombia in 2009 – a wonderful and delightful place. I was lecturing in Bogota Cali Medalin Baranquilla and Cartagena and I have no idea now where the pictures were taken! Apart from the gold museum in Bogota! So now the shots I have of the Salt cathedral have a destination attached for which much thanks. I have a miners memorial, Botero sculptures ? Medallin, a ranch and various churches still to identify, a parador shaped like a sombrero was on the road to Cartagena and the amazing trompe d’oeil paintings on the houses I think were from the cable car also in Medallin ! So you have helped greatly. Best wishes with the blog.